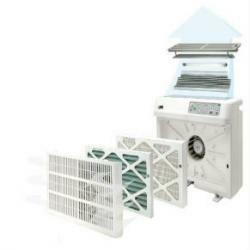 • Unique: Six Stage Air Purification – HEPA, Odor Control and PCO technology. • Efficient: Cleans air down to the last molecule. • Air Volume Control: Automatically adjust to accommodate size of room and toxicity of the air. • Infrared Motion Detector: Detects movement in a room and automatically increases air purifier performance until toxicity decreases. • Air Quality Indicator: Shows relative toxicity of the air and overall volume of air passing through the unit. • Media Indicators: Indicates when filters and UV lamps need to be replaced. 1 year uv bulbs, filters 2 years, 2 year limited warranty on all components. Click the button below to add the All in One Ultimate Air Purifier to your wish list.